I’ve written on this blog many times before on the challenge of differential attainment in universities. Full disclosure – I no longer work in the sector, I’m white, middle class and educated at what is now a Russell Group university. This could be relevant, it may contextualise my opinions. According to the recent report from Universities UK “Patterns and trends in UK higher education 2017“, then once again we can see data on degree attainment split into a crude ethnicity breakdown of “white”, and “BME”. the supplementary data provided add “other and don’t know”. 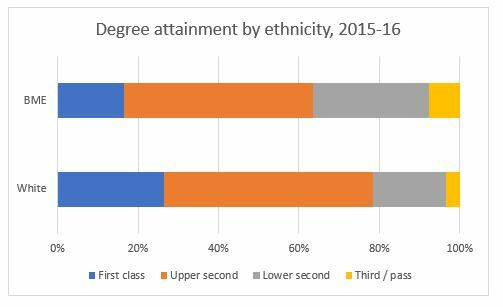 showing that the attainment gap between white and BME students stubbornly remains at about 15% when we consider “good degrees” to be a 1st or 2(i). Equally telling however, is the wide differential in numbers of first awarded to different groups, and the fact that BME students are more than twice as likely as their white counterparts to be awarded a third. Clearly, a lower degree classification affects life chances in terms of potential graduate employment. Data and evidence have long been available to show that for given entry characteristics, BME students are less likely to obtain a good degree classification than their counterparts, so we should be asking where we have to look to understand why our universities do not appear to be operating as the progressive liberal meritocracies they claim to be. equity, inclusion and social justice” explores how inequalities in access to elite universities continue to exist for those from black and minority ethnic backgrounds and suggests that gaining a place at an elite university is related to access to social and cultural capital. Referencing “The Diversity Bargain: And Other Dilemmas of Race, Admissions and Meritocracy at Elite Universities” ,by Natasha K. Warikoo, Professor Bhopal identifies themes that, for me, have resonance with Reni Eddo Lodge’s recent book “Why I am no longer talking to white people about race“. Reni Eddo Lodge defines what she calls structural racism: “This is what structural racism looks like. It is not about personal prejudice, but the collective effect of bias. it is the kind of racism that has the power to drastically impact people’s life chances. Highly educated, high earning white men are very likely to be landlords, bosses, CEOs, head teachers or university vice chancellors”. She places this definition firmly in a reading of British history, and again shows that belief in the meritocracy satisfies those who currently benefit from it. Bhopal proposes mandatory unconscious bias training for staff in universities as well as identifying the need to develop social and cultural capital in good schools prior to university. Unconscious bias training is a good start, but I have heard it described by Gurnam Singh of Coventry University that a limitation is that “it shows you’re a little bit racist, but that’s ok because it’s unconscious”. Unconscious bias assessment and training is just one step on a journey – it’s what you do next with that knowledge so how is this followed up?. Also (and from a data nerd you know this is coming) the HESA datasets can be mined to provide much more information. Institutions can identify how they perform individually against this national average – by definition, some will perform better and some worse) and combine with their own internal data. Does this tell you anything about differential outcomes by discipline, by department? In fact, are you even aware of how students of different ethnicity are distributed across your university, as they are almost certainly not evenly distributed? A further issue is the feeling of belonging, and the right to belong. If as Bhopal states universities “maintain their status by representing themselves as white and middle class, spaces reserved for those who are just like them”, then it would be useful to explore the extent to which staffing (particularly academic, professional and management) reflects the make up of the student body. If all your lecturers are white and middle class, then this might be sending a strong signal about who university is for. Once again, the HESA data can be used to look at staff profiles, and it would be an interesting exercise to look for any correlation between staffing profile, student profile and degree outcomes. Finally, what happens on graduation day? Let’s say you have a department where 50% or more of your students are from a BME background. What did the academic procession look like, especially the senior staff? Similarly, of the recipients of honorary degrees, how many of them are from the same background and are representative and aspirational role models for your students? I know I don’t have the answers, I’m just hoping to add some more questions to help understand, and to shine a light on areas where changes could be made. Only moments after publishing this, my attention was drawn to a new publication on the Wonkhe website, which provides the HESA data on degree attainment, and the gaps, by institution. You might want to wander over there and read Nona Buckley-Irvine’s piece “Universities’ shame – unpicking the black attainment gap“.